Ecobnb is a community dedicated to sustainable tourism, which offers to travelers from all over the world the opportunity to find and book a vacation in harmony with nature. Ecobnb.com is a marketplace to book your environmental-friendly accommodations, with a quick search system integrated with social media and developed for smart-phones, which highlights in a clear way sustainability requirements of each bio hotels, farmhouses, bed & breakfast or apartment. Ecobnb is a community want to discover a more sustainable way of travel, in harmony with nature, places and people. b. What can I find in Ecobnb? 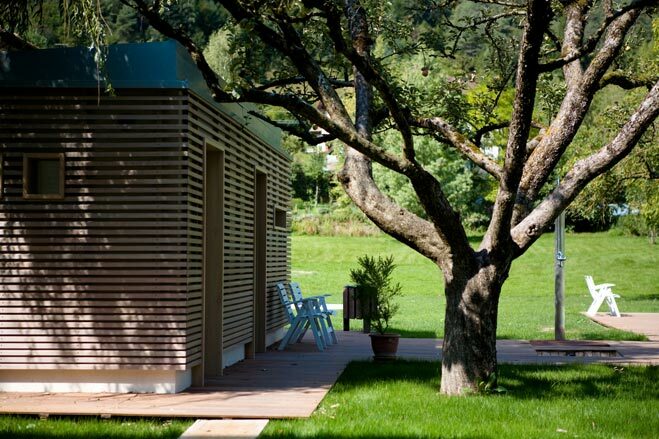 In Ecobnb.com can find every type of eco-friendly accommodations: such as organic houses surrounded by nature, bio Bed & Breakfast in an historical villages, tree houses, ice-igloos, bio hotels with a small impact on the environment, chalets and mountain retreats without CO2 emissions. 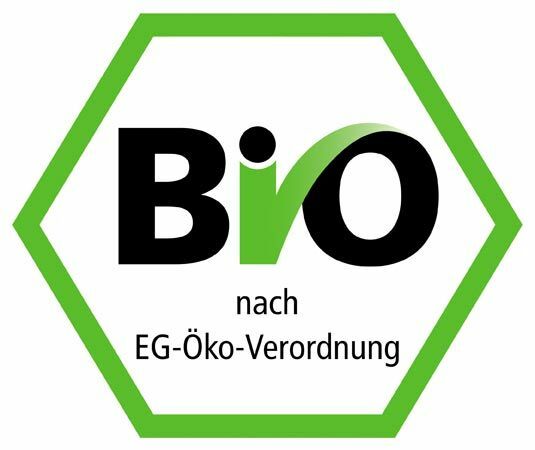 c. Why list my eco-accommodation in Ecobnb? • To underline and promote the ecological quality of your accommodation. • To get your eco-accommodation available, in a few clicks, for travelers that are looking for sustainable tourism. • To share the challenge we have taken to improve the world and make it more sustainable way of traveling. d. Why click on Ecobnb.com? • To save time in useless research, and know all about the environmental quality of accommodations you are booking, verified by travelers reviews. • To find and compare easily the preferred accommodations, also with its environmental requirements, such as organic breakfast, clean energy, or bicycle rental service. • to respect the environment and share ecotourism experiences. e. What environmental requirements are requested? The accommodation’s building has a high level of energy efficiency (its annual energy consumption is less than 60 Kwh/mq), and is designed in harmony with the natural features and resources surrounding the landscape. In order to reduce the environmental impact of building, the accommodation uses materials from local sources, energy-efficient technologies, and takes care ot the landscape surrounding it. The International Energy Agency estimated that existing buildings are responsible for more than 40% of the world’s total primary energy consumption, and for 24% of global carbon dioxide emissions. An impressive amount of energy (more than 65%) can be saved simply applying energy-efficient technologies to the touristic accommodations. The first rule is that the greenest building is the building that doesn’t get built. Since construction almost always degrades a building site, not building at all is preferable to green building, in terms of reducing environmental impact. The second rule is that every building should be as small as possible, to reduce the consumption of natural resources. The third rule is not to contribute to sprawl and to use most energy-efficient and environmentally friendly methods. 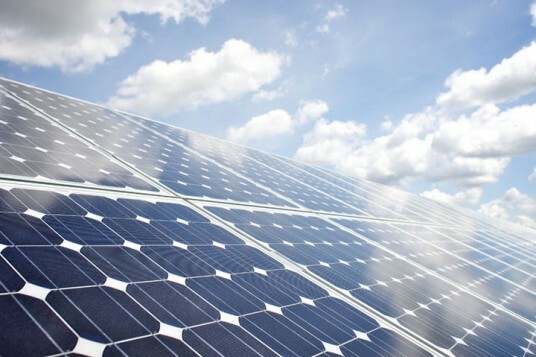 The electricity used by the accommodation come 100% from renewable energy sources, such as wind energy, solar energy, geothermal energy and other renewable sources. The touristic accommodation can generate on-site renewable energy, or buy it from suppliers of renewable energy (100% from renewable sources). The accommodation produces hot water from renewable energy, using solar hot water systems. Solar hot water heating systems may be used also for pool heating or for indoor heating with an underfloor heating system. Cleaning products used by the touristic accommodation for the cleanliness of the rooms, the laundry and the dishes are made ​​from natural products. Detergent and cleaners are highly biodegradable and environmentally friendly. 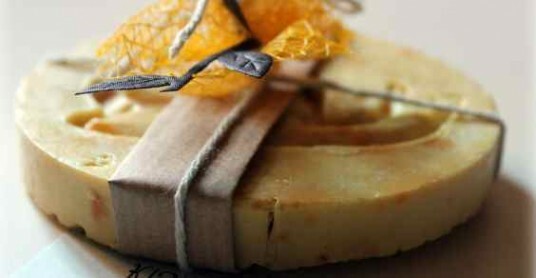 Soaps and deodorants available to guests are natural and organic. The accommodation does not use chemicals cleaning products. Waste (residual waste, paper, plastic, metal/aluminium, organic waste) is separed, recycled and disposed in a appropriate manner. The touristic accommodation exceeds 80% of waste differentiation. Are ​available to guests in public areas bins for recycling paper, glass, plastic and cans. Waste separation reduces non-recyclable waste and costs for disposal. Respective bins and informations are available to guests. 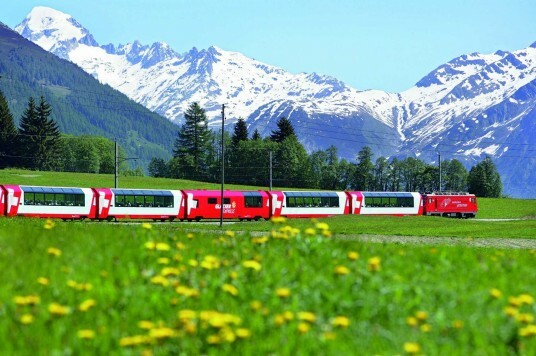 Is possibile to reach the accommodation by public trasportation or by shuttles to public transportation hubs. Information on the accessibilitity with pubblic transportation is provided to guests. This can be done by website, e-mail or other channels. The use of public transportation is encouraged. Incentives (price reduction, welcome drink, etc.) can increase the use of public transportation, electric cars, bycicles or car-pooling. The touristic accommodation reduces electricity consumption using energy-saving lamps. At least 80% of all light bulbs in the tourist accommodation shall have an energy efficiency of Class A.
Energy-saving lamps can help to save energy easily and effectively. While providing the same brightness and a durability which is 10 times higher than conventional light bulbs, energy-savings lamp uses up to 80% less energy. Using energy saving lamps does therefore not only benefit the environment but also upur purse. The accommodation reduces water consumption using water flow reducers. Water flow restrictors are nozzles which are attached to water tab to reduce the amount of water to 6 liters pro minute or less, and to strengthen the water jet. Therefore water flow restrictors reduce the water consumption. The touristic accommodation also promotes raising awareness of the guests to save water. The accommodation is recovering and reusing rainwater. 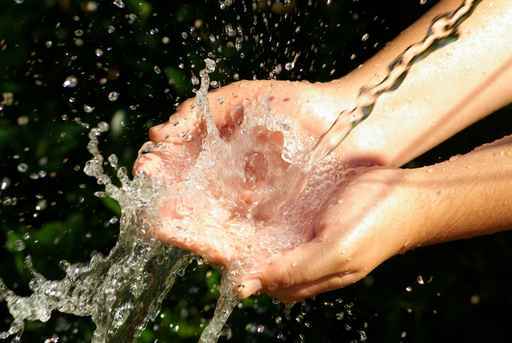 Rainwater is collected and reused for secondary uses (toilet flush, garden irrigation, etc.).. 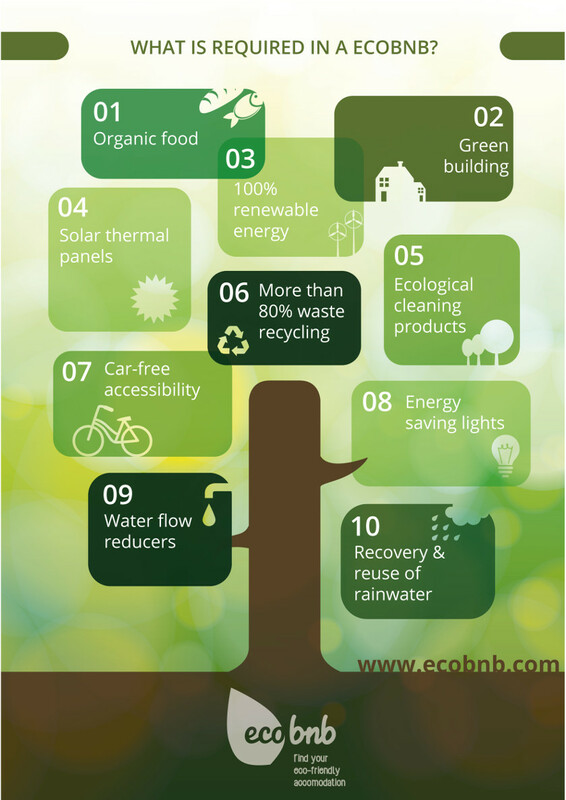 These are the 10 key sustainable requirements, on which Ecobnb focus the most attention, and on the basis of which are selected the eco-friendly accommodations in the network. These eco standards are self-certified by the accommodations and are verified by travelers through targeted reviews. If you do not have at least 5 of the 10 main requirements you can still improve your environmental quality. In Ecobnb Blog you will find many useful tips to be more eco-friendly, saving energy and resources, improving your eco-sustainability. f. What other eco requirements are highlighted? Bicycles are available for the guest, in order to provide alternative modes of transportation, to reduces guests’ reliance on cars, and to encourages guests to explore the surrounding area in an eco-friendly way. The food used in the composition of the menus is mostly regional. The regional sources are indicated in the menus. The definition “Regional” is determined by each accommodation itself. It refers to the radius of kilometers or to a defined region. Depending on the product, “Regional” can mean that the purchasing takes place within a few kilometers or wider regions. The touristic accommodation has sustainable furniture, that are: a) tested for harmful substances; b) built stable and safely, repair friendly through long-term available spare parts; c) built with wood from sustainable forestry as well as recyclable. The green areas of the facility are managed according to the criteria of organic farming, preferring native species, or plants that arise naturally in the environment of the structure. The accommodation don’t use single dose products. By using refillable soap and shampoo containers, waste can be reduced significantly. Instead of replacing empty containers by new ones, soap and shampoo is refilled from bulk containers. The accommodation don’t use disposable packaging. By buying products with reusable packaging instead of disposable packaging (disposable dishes, towels or cups) as well as by buying fresh unpackaged products the amount of waste is reduced. The accommodation purchases local products and services. Guests perceive regional menus, drinks, etc. as a high-quality products. Accommodation providers should therefore inform their guests (by flyers, leaflets, websites, etc.) about nearby regional restaurant and other providers, in order to support the local economy. The accommodation uses lighting control systems, such us motion sensors, daylight sensors, or timers. In areas of permanent lighting, motion sensors are to provide automatic on/off switching in order to save energy. The accommodation has linen reuse policy changes guest linens and towels only upon request or every few days, rather than every day. This saves significant amounts of energy and water, uses fewer chemicals, and results in lower greenhouse gas emissions. The tourist accommodation communicates to the guests to ensure that guests are aware of the option to reuse their linens and towels. The accommodation reduces energy and water consumption using recycling paper (toilet paper, printing paper, paper for advertising material). Recycled paper is made out of old waste paper or card board and is therefore environmentally friendly. Recycled paper saves timber reserves and, compared to conventional paper production, uses two thirds less energy and water. When buying paper (toilet paper, printing paper, paper for advertising material), recycled paper should always be the first choose. The accommodation reduces water using water-saving toilet. Flush water can be reduced by using water-saving toilet tanks or by just putting an object into the toilet thank so that less water is refilled (less than 4,5 liters per flush). Appliances (refrigerators, washing machines, dishwashers, televisions, etc.) have the EU Energy Label Class A. 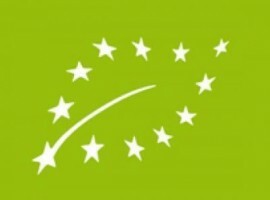 Products that are EU Energy Label rated are identified by the tag (as shown below). The label is also commonly placed on marketing the brochures and instructional manuals. The accommodation uses natural air conditioning, or air conditioning systems with at least Class A energy efficiency. The accommodation uses boiler or furnaces provide heating for the building that have an efficiency of >90% (as measured according to EU Directive 92/42/EEC). Hospitality Tourism buying local products and services. Guests consider food and local drinks as high quality products. The accommodation must therefore inform their guests (through flyers, brochures, websites, etc.) services, restaurants and activities in the area, in order to support the local economy. The accommodation is organizing events and promotions which sensitize the customers’ attention towards ecotourism, such as walking, hiking or horseback riding, bike tours, boat activity, visits to local organic farms, cooking classes or rediscovery of local traditions, conferences or seminars on environmental issues, and so on. The accommodation supports local projects to improve and protect the environment. Asking for guests satisfaction is important for the qualitative development and can be carried out in different ways. The best way is to use a standardized questionnaire which can include questions or guest suggestions regarding sustainability. The green areas of the accommodation are managed according to organic farming, using plants that occur naturally in the property’s local environment. The eco-friendly accommodation has Ecolabel or other environmental certifications. These eco-sustainability requirements are self certified by the accommodations that are part of the Ecobnb network. Promotion of your ecological accommodation, through a special web page dedicated to your accommodation, through a travel blog and social media pages. Quick search of eco accommodations, adapted to the mobile phone, and the system of direct contact of travelers. Direct access to the website to insert or update information about your space. Promotion of your special offers and green events to eco-travelers. Discounts and special conditions with the Ecobnb partners. Ecobnb logo and banner (that you can link in your website). 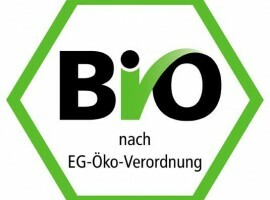 Newsletter about ecotourism and green marketing. Promotion of your accommodation through fairs, festivals, contests and much more events about eco-tourism. Promoting your business through social media: Facebook, Twitter, Pinterest, Instagram. h. How much does it cost? – listing for free and contribution of 10% on the online bookings. – annual membership (150 € pro year, less than 50 cents per day) without other costs. – Your listing will be shown in the home page. – Your listing will be first in the search results page. – Ecobnb will post a blog article, sharing it on social media channels. i. How Ecobnb.com promotes my eco-accommodation? j. What about the green leaves? Ecobnb shows the environmental sustainability of your accommodations by adding one or more green leaves near the name of your accommodation. k. As is assigned the number of leaves? 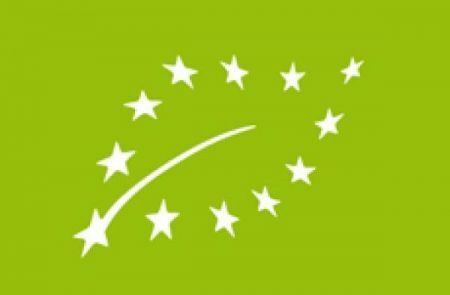 Based on the number of environmental requirements that your accommodation has, green leaves appear to be 0 (if it has 5 of the 10 core requirements, is the minimum to be part of Ecobnb) to 5 green leaves (if it has all 10 main requirements ). Tourists who visit your eco-accommodation can leave a review about the quality of services, the environmental sustainability and the environmental awareness of your accommodation. n. How Ecobnb guarantees its commitment to the environment? Ecobnb promotes tourism with reduced environmental impact, stays in eco-sustainable accommodations, organic food, environmentally friendly itineraries, and the rediscovery of local places. Our Servers are powered 100% by renewable energy, produced on-site (Hetzner Online). Ecobnb is born thanks to the European project EcoDots, co-funded by the European Community, to promote sustainable tourism in Europe.